1.2 Minerals are not free! How does one reprocess minerals? The simple answer is that you right click the minerals while they are in a station/citadel/POS reprocessing array and select the Reprocess option. In a station or citadel, the reprocessing window comes up, and you can decide whether or not to reprocess your ore. NOTE – in a POS’s reprocessing array, there is no confirmation or reprocessing window, the minerals are automagically reprocessed instantly upon selecting Reprocess in the right click menu – so take care! The reprocessing window has a good bit of information in it for you. If you mouse over the % bar or the ore itself, it will tell you the base yield based on the structure you are reprocessing in as well as the bonuses you get from your skills. The formula is reasonably complex and will be explained later in this section. The window also shows you the output results you will get in minerals, and if there is a tax on reprocessing, will show that in the lower right corner as well. If you choose to reprocess, you click the Reprocess button in the lower right corner, and the minerals will be put in the inventory of the station/citadel/reprocessing array. An important thing to consider when you contemplate reprocessing your ore into minerals is that reprocessing is incredibly dependent on both location and skills. The difference between reprocessing with an unskilled character in an un-bonused location and reprocessing with a perfectly skilled character in a bonused location can be significant – on the extreme end, with the right skills and location you can more than double the amount of minerals you get from a set quantity of ore. If you are in an alliance, it is worth finding someone with good skills to reprocess for you, many alliances have people who would do so for a tip. You know the old saying “Location, location, location”? This is especially true with reprocessing! In highsec most stations have a 50% base yield, but there are a few that go as low as 25%. Citadels and engineering complexes have a base yield of 50% and are able to equip rigs to bonus reprocessing. T1 rigs move the base yield to 52%, T2 rigs move it to 54%. 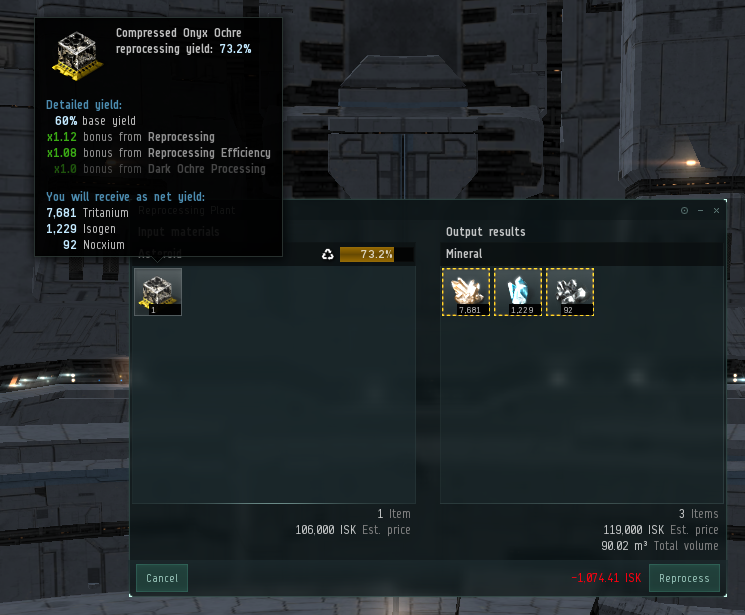 Citadels in lowsec and nullsec also get a bonus based on location. Citadels in lowsec gain an additional 6% base yield, while nullsec citadels gain an additional 12% base yield. Thus, with T2 rigs in nullsec, a citadel can give a base yield of 60%. Along with location, skills are vitally important in reprocessing, and there are a number of them that can increase your yield. Training Reprocessing to V will add 15% to your yield, Reprocessing Efficiency V will add 10%, and the ore specific reprocessing skill will add an additional 10%. There is also an implant that can add up to 4%. Max reprocessing yield is then 78.15% in highsec, 82.84% in lowsec, and 87.52% in nullsec. Please note that each ore has an associated ore reprocessing skill. Veldspar is bonused by Veldspar reprocessing, and Gneiss is bonused by Gneiss reprocessing, etc. These skills can take a great deal of time to train completely. At the end of this section is a skill plan for a perfect refiner for all ores and ice – and it takes quite a long while to train. If you only mine in one section of space, it is a great time saver to train the reprocessing for only the ores you use. Reprocessing also applies to ice – though instead of the ore specific skill, you have the skill Ice Processing that adds 2% per level trained for a max gain of 10% to your yield. Reprocessing ice works the same way as with ore. There are three implants that increase reprocessing yield – They are the Zainou ‘Beancounter’ Reprocessing RX-801, 802, and 804 and they increase yield by 1%, 2%, and 4% respectively. The RX-804 requires Cybernetics V to plug in, and if one is doing a large volume of reprocessing, is definitely worth the train and expense. NPC stations all have a tax for reprocessing which can be reduced by increasing your standing with the NPC group. In citadels, the tax is set by the owner, so you should always be aware of what the owner is charging. Instead of taking a percentage of the mineral output – you instead pay a percentage of the estimated value of the minerals as calculated by CCP. Refining Skill level – level one = 1, level 2 = 2, etc. Reprocessing Efficiency skill level – level 1 = 1, level 2 = 2, etc. Ore specific/ice processing skill level – leve 1 = 1, level 2 = 2, etc. Bubbles is a highsec industrialist but hasn’t been playing very long. She has some reprocessing skills, but they aren’t all maxed. She decides to reprocess some Veldspar in a T2 rigged citadel in highsec, her refining skill is 4, her reprocessing efficiency skill is 2, her Veldspar processing skill is 3, and she has a 1% implant plugged in. George is a nullsec industrialist with high skills and his very own T2 rigged engineering complex – he has Refining V, Reprocessing Efficiency V, but is still training his Mercoxit reprocessing which is 4 and he has the 4% implant. Using your Reprocessing Efficiency to calculate what minerals your ore will reprocess into is a relatively simple process of dividing your yield % by 100 and then multiplying by the theoretical “perfect” amount of minerals given if one could achieve 100% reprocessing efficiency. (This is impossible, the game always has the waste factors built in, this is just how it is calculated). 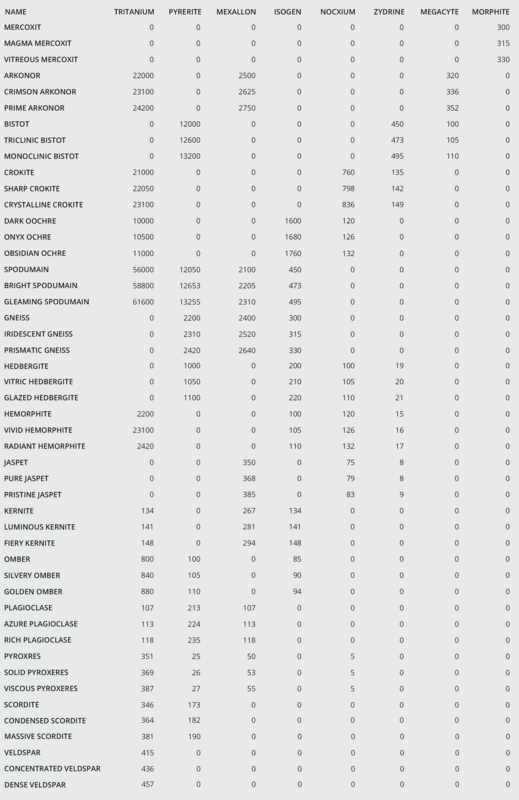 The following chart shows the theoretical perfect mineral products for each type of ore. Please note that reprocessing is done with non-compressed ore in batches of 100 units and with compressed ore in batches of 1 unit. (100 units of uncompressed ore is compressed into 1 unit of compressed ore). Ice reprocessing is done in units of 1, whether the ice is compressed or not. So George will get Morphite = 5 * 300 * (85.93/100) = 1288.95, rounded down to whole units, George will have 1288 Morphite. 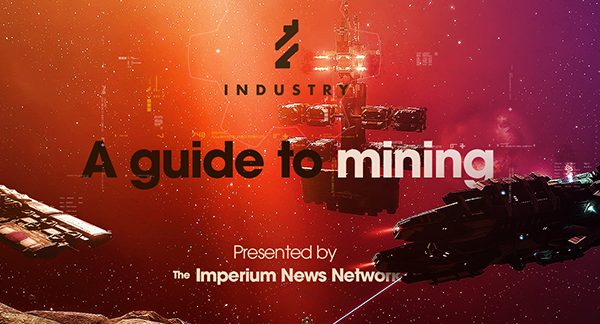 One thing heard frequently when talking about industry, especially with new players – is the assumption that minerals are free if you mine the ore yourself. This is not true, nothing in eve is free – you always pay, even if it is just in time. An important thing to consider is the opportunity cost of what you are doing. If you are spending 5 hours to mine the ore to process into minerals to build something – you could also spend those 5 hours running missions or ratting. Is what you are doing with the ore and minerals worth more than what you might make ratting? 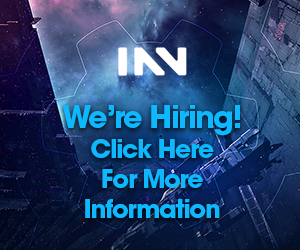 The answer does not necessarily need to be yes – if the amount of isk you make from both is comparable, or even the mining slightly less the consideration of which you prefer to do is important. 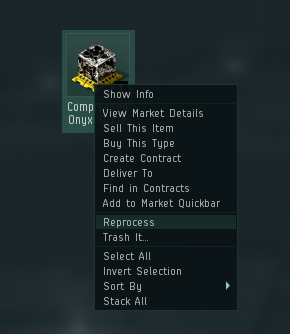 If you could make much more isk doing something else it would be wise to consider doing the other activity and then simply buying what you would have made with the isk. 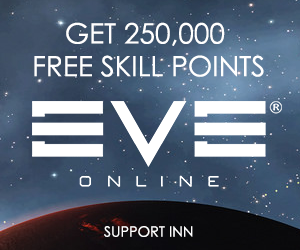 In the end, if you still believe the minerals you mine are free, I would be happy to take them off you for the appropriate amount of isk (that being zero, because they are free).